Gunung Daik is the highest point of Lingga island off the east coast of Sumatra. It is a very striking mountain, with two jagged peaks and a third lower one. The highest is Daik, the middle Pejantan and the lower of the three is named Cindai Menangis. Nobody has ever reached the highest peak because it is a very serious rock climb but a Belgian rock climber reached the top of Pejantan about 20 years ago with the help of 9 locals over 5 days. 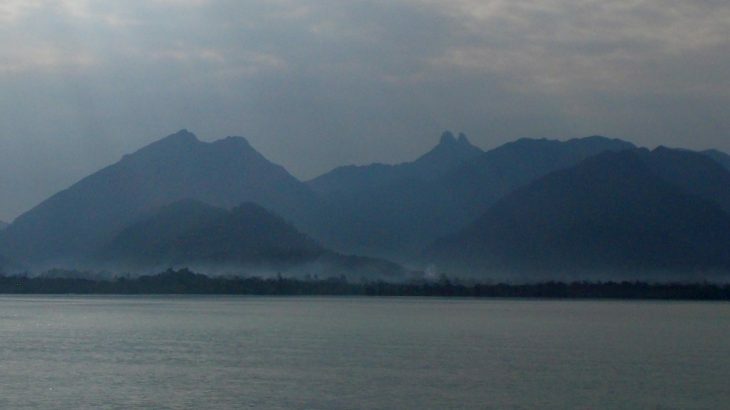 The shape of the highest peak of the mountain gives the island its name – linggam is Sanskrit for ‘phallus’. Although this is a remote and sparsely-populated part of the Riau islands, it is probably just about possible to reach the island in one long day from Singapore (via Batam) if you can make it in time for the 11am ferry leaving Tanjung Pinang each day. Indeed, many folk first notice this remarkable mountain when flying over the island to or from Singapore. The ferry journey itself is a great one so long as you either get a window seat or wander outside from time to time to enjoy the views of small fishing villages. The daily ferries call at a number of remote communities and few tourists come here (at the moment). There are actually two piers on Lingga that the ferries call at: Sungai Tenam in the north of the island and Tanjung Buton in the south. Between these two stops there are a couple of others (tiny Pulau Pulon plus Jagoh on Pulau Singkep). Tanjung Buton is much closer to Gunung Daik, but if you are in a group and don’t especially enjoy boat journeys then consider getting off at Sungai Tenam and hiring a car to Kota Daik (roughly 40km) as Tanjung Buton is another 2 hours beyond Sungai Tenam if you stay on the ferry. 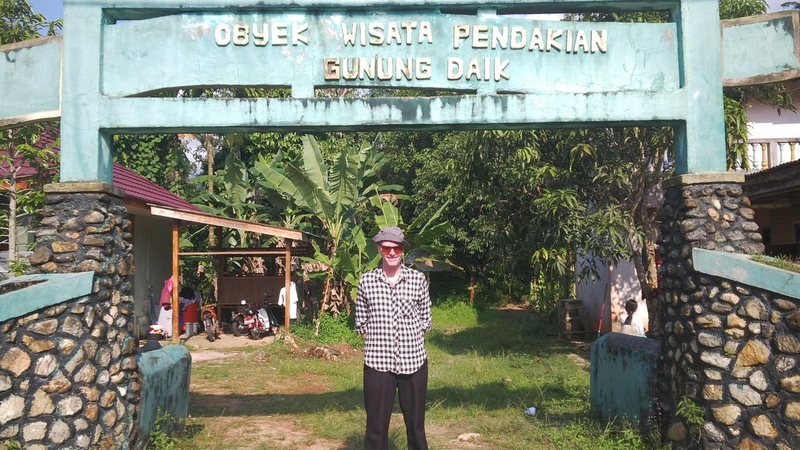 The trailhead is just 3km or so outside the main town of ‘Kota’ Daik, which is itself just 15 or 20 minutes by ojek from Tanjung Buton pier. Keen hikers can do a day-hike of Gunung Daik if they start early and are happy to trek for ten hours or more (in total), though bear in mind that the cliffs at the top are severe and you may not even see them from the trail as, being the only significant mountain for a very long distance in all directions, the highest peaks are often shrouded in cloud. It does however make a great forest trek. For those wishing to do a bit of proper rock climbing, and anyone genuinely hoping to try to climb to either of the two highest peaks, you will need several days and a great deal of rock climbing experience. From the entrance arch at the trailhead near Kampung Pahang (if you pass the Pahang mosque you are heading in the right direction out of town) the trekking is mostly on flat ground but at sea level – meaning an early start is desirable to avoid the hottest part of the day. The path passes pepper and rubber plantations and you soon reach a sign for Makam Megat Kuning – ancient royal graves of considerable significance. If you have time on the way back it may be worth a visit, but for now turn left to continue to Gunung Daik. After another ten minutes you will reach an old wooden bridge over a small river. It is best to go one by one over it as it may no longer take the weight of several people. From this point the path follows a white water pipe and after another 15 minutes you will have reached a sign for forest conservation. After a further 10 minutes you will be at Shelter 1 (also known as Gajeboh 1) which is just a few metres from Lubuk Fatimah (may also be called Lubuk Belacan). This Shelter is well-constructed and has a proper roof so in heavy rain it would make a good place to have a rest, though it should have taken you no more than 45 minutes or so to reach this point from the start of the trail. The trail now leads across the wide but usually gently-flowing river, so be prepared to either wade across in boots or else take them off. A couple of small streams feeding into the river are now crossed and there are a couple of rather overgrown sections. However, do keep your eyes peeled for pitcher plants as there are plenty in this area. The species on this mountain are Nepenthes gracilis, ampullaria and their hybrid – thanks to Alastair Robinson for IDing them. The trail continues to follow a water pipe but by this point it is grey. The path continues alongside the wide river and after less than 2 hours in total from the start you will reach a ‘pipe bridge’ that goes over Sungai Teko – a small river (90m above sea level). Check your clothes for leeches at this point as there are one or two on the trail. 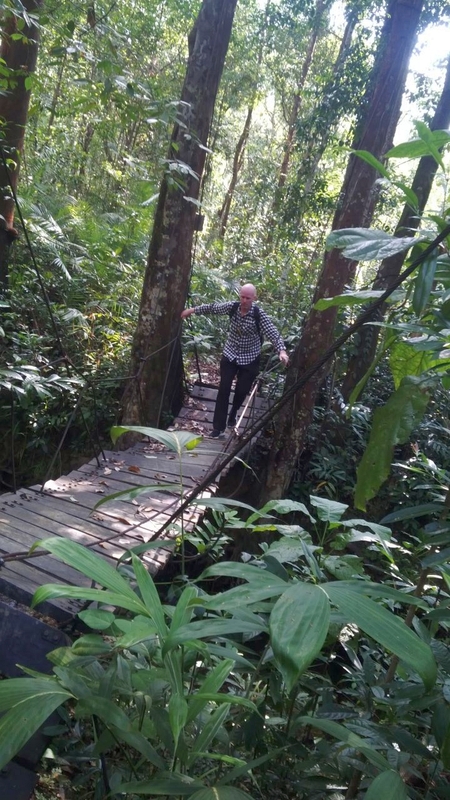 The path climbs slightly to an area of magnificent trees with buttress roots (120m), a number of which are part of a scientific study relating to carbon emissions by scientists based in Bogor, West Java. A couple of these grand trees have toppled over so this is perhaps the most tricky section of trail. Soon you will reach Shelter 2 (230m) where there is another decent shelter to take a rest. There is a nice river 3 minutes away down to the left where there is a small waterfall and pool for bathing. From Shelter 2, the mountain trail continues to the right and passes several signs with seemingly contradictory information about how much further it is to the top. Perhaps some signs means the base of the cliffs and some simply mean the so-called camping area (Shelter 3). Listen out for monkeys around here as the trail starts to lead up the mountain finally and onto some steep ridges. An hour on from Shelter 2 and you will be on a fairly narrow ridge with a few views between the trees to the higher slopes of the mountain. If you can see a peak to the left it is probably Cindai, the lowest of the three but most accessible. The most dramatic part of the trail comes next and is known as Punggung Naga (dragon’s back, 600m) and is a very narrow ridge with good views on both sides. Be very careful here and remember to use the ropes that are tied to branches as a fall would be disastrous. You should be able to see Kota Daik below on the left and also the coastline. 90 minutes beyond Shelter 2 (or about 5 hours of hiking in total, not including rests) and you will have reached Shelter 3 (730m) which is also known as the campsite. To be honest, it is not flat because of all the lumpy roots and there is no shelter, so spending a night here may not be the most comfortable -although the views are fine. A sign here suggests that there is another kilometre of trail to go, presumably in terms of distance, and this is likely to take around 90 minutes in total, though it is farily steep. From what we can gather, the trail ends at the base of the steep cliffs of Cindai, around 1,050m above sea level. Fast hikers with daypacks can make it back down to the trailhead in about 4 hours. It’s a shame that more of the summit cliffs cannot be seen by ordinary hikers (as opposed to expert rock climbers) but the trekking here is pleasant and a trip to Gunung Daik is a great excuse to explore a remote and friendly island that still sees few tourists. Bagging information by Dan Quinn (March 2017). Thanks to Nick Hughes for lending me his GPS for height readings! Getting there: A ferry leaves Tanjung Pinang ferry terminal on Bintan island every day at 11am (Rp170,000 per person in March 2017) and takes around 5-6 hours to reach the final stop in Tanjung Buton, Lingga. A return service leaves Tanjung Buton every day at 7am (Rp169,000 in March 2017). Accommodation: Several basic hotels in Kota Daik, just 3km from the trailhead. Permits: Take a local guide and he will notify any authorities that need to know of your plans. Water sources: Available at Shelter 1 (30m) and Shelter 2 (230m). Also available at Shelter 3 / campsite (730m) (but not recommended as the water is a fair distance down and over tricky terrain). Fill up at Shelter 2. Kepulauan Riau, Updated Kurang Tinggi. permalink. 1. If we are going to spend a night, is it cold? What is the temperature? 2. Do i have to bring a lot of money? Is there anything that i need to spend on? Since this will be a trip with friends, they have already prepared all the basic needs for 5 days. Including food, accomodation, the permit and the ferry ticket (return). I was very impressed with the new Tanjung Pinang Airport – much improved since the last time I visited in 2013. It is now international (a handful of flights from China), and there is a map of the island (Bintan) on the wall – ideal for visitors trying to get their bearings. A taxi from the airport into Tanjung Pinang town is apparently a standard Rp120,000 (though the return from town to airport can be found for 80,000 via some hotels so it does make you wonder) and takes about half an hour. I wanted to be as close as possible to the ferry terminal (Sri Bintan Pura) for the following morning, so I stayed at Hotel Gunung Bintan Jaya, less than 5 minutes walk away. It has wifi and is Rp190,000 for a standard room. Some rooms seem to be significantly better than others. If you look foreign, most folk will think you are over from Singapore, so you will most probably have people wandering after you saying ‘Batam! 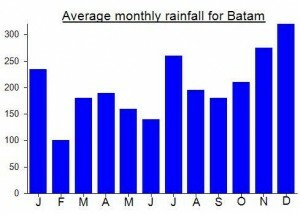 Batam! Batam!’ trying to sell you tickets as if you hadn’t heard them the first, second, third or fourth time. Nevertheless, if you can ignore the usual repetitive comments every 30 seconds (or just prepare a recording with the phrase ‘tidak mau, tidak mau’ as you wander around), Tanjung Pinang is an interesting traditional town with a considerable Chinese population. The boat to Phallus Island (Pulau Lingga) is currently either Mv Lingga Permai or Mv Arena 2/3. The outward journey took 6 hours and the return only 5, so it depends on the vessel and on how much luggage is onboard. There’s a lot of work going on at Bintan pier at the moment – renovation or upgrading of some kind, meaning that hearing announcements inbetween drilling can be a little difficult. The trip was almost the same in both directions, with the boat calling at Benan, Rejai, Tanjung Kelit (Pulau Bakung), Sunggai Tenam (north Lingga), Pulau Pulon, Jagoh (Pulau Singkep) and Tanjung Buton (Lingga). The boat journey is worth the effort alone – some brilliant views to be had of countless small communities. It’s hard not to be impressed with the smart, clean jetty and relaxed atmosphere at Tanjung Buton. In March 2017, an ojek from Tanjung Buton to Kota Daik is a very reasonable Rp20,000. Lingga Pesona seems to be the nicest hotel in town, but also the one that fills up first. Second choice was Penginapan Sun Ling – AC/deluxe for Rp176,000 or economy for Rp99,000. The ‘kota’ itself is a fairly small town of attractive wooden houses over what looks to be mangrove swamp. Gunung Daik is very imposing if you are lucky enough to see it free of cloud. The hotel found me the perfect guide…. Pak Citro, from Medan originally, who runs Kepal Lingga – Komunitas Pecinta Alam Lingga and is also a good artist. His number is 0812 77258269. We met in ‘Warung Bandrek’ (probably not signed but known to locals) with Kepal Lingga photos in it. He and his friends hike up Gunung Daik aswell as Gunung Sepincan, another 1000metre-plus mountain on the same island apparently offering good views from places such as Bukit Permata. Pak Citro turned out to be great… he has a very good knowledge of local plants and trees and will point out pitcher plants on the trail if asked. We ate some ‘riang’ leaves at Sungai Teko river which are apparently good for an upset stomach. Sadly the weather was not in our favour and there was a fair few showers as we proceeded up the mountain. The trail itself was pretty clear and easy to follow for the most part, though it would be daft to do it without a guide. As we had started at 8.30am (as Pak Citro had to ask permission to take a day off work) we ended up turning back a little before the end of the official trail. No great loss as the chances of scaling the peaks without lots of equipment and several extra days were miniscule. We were perhaps only 10 or 20 minutes away from the end but we were running out of daylight hours and the drizzle and thick clouds meant we would have no views even of the base of the summit cliffs. So we decided to turn back. There are a few simple warungs in town offering the usual Indonesian meals. The small Padang-style restaurant by the small bridge seemed popular with locals – a good sign. It’s worth getting to Tanjung Buton pier early on the day you leave as it’s the ideal place to take photos of Gunung Daik before boarding the 7am ferry. Had some great conversations on the ferry, including with a woman working for Kepulauan Riau tourism who had studied in the UK, and a chap telling me about the Sultan of Riau and the sinking of HMS Dragonfly. from batam by boat to gunung daik how many hour? what is the charges? minimum how many person? total how much per person charges? Hello there. Not sure for most of your questions, but it sounds like it is best accessed from Bintan island. One ferry a day apparently. I hope to visit the island next month so hopefully the page will actually be informative after that….. I have climbed this mountain in 1999, to guide Pierre Kintgen (Member of The Explorer Club). We manage to climbed the Pejantan (+/-200m) vertical cliff and reach the summit of Gunung Daik. It was a two days climb. The total trip was 4days 4night.